Company liquidated 1974, catalogue purchased by Festival Records. Acquired by Warner Music Australia, October 2005, following the liquidation of Festival Mushroom Records. Spin Records was one of the most important and successful Australian record labels of the 1960s, and it recorded and released some of the most vibrant and enduring pop artefacts of the period. Historian Bill Casey has recently published a comprehensive history and discography of the label and in particular its relationship with The Bee Gees, and we are indebted to Bill for his invaluable research into this important company. The origin of the Spin label was the shortlived "Everybody's" imprint, which was set up in late 1965 by the Packer-owned Australian Consolidated Press as a cross-promotional vehicle for its teen magazine Everybody's. The founding company principals were Frank Packer's elder son Clyde and four directors of Everybody's. Around the time the label was being set up, the directors were approached by TV producer, songwriter and entrepreneur Nat Kipner. Kipner had until recently been a partner in Ivan Dayman's Sunshine label and had managed Dayman's Sydney venue, The Bowl, in Castlereagh St . The Everybody's management appointed Nat as the label's A&R manager and he quickly signed up four local acts. One was his son Steve's new band, Steve & The Board, for whom Nat wrote a novelty song, "Giggle-eyed Goo". The other three were ex-Aztec guitarist Tony Barber, a young female singer called Toni McCann, who had recorded for Sunshine, for another single release, and big-voiced Sydney singer Big Norm Miller. Everybody's released only four singles in its brief life. The first two releases were the Steve & The Board's "Giggle-Eyed Goo" b/w "Rosalyn" (produced by Nat Kipner) and Tony Barber's "Someday" b/w "Is It Raining?" (produced by Bill Shepherd) and simultaneously issued in either October or November 1965. They sold moderately well, and "Giggle-Eyed Goo" even made the charts in Sydney, but record buyers were apparently confused by Everybody's association with the label, with many thinking that the records came free with the magazine. According to Hank Facer, the singles also encountered resistance from radio stations problems because of the Consolidated Press connection and Bil Casey reports that Sydney DJs were unwilling to name the label on air because of the cross-promotion for the magazine. The last two Everybody's singles, issued either in December 1965 or January 1966, were Big Norm Miller's version of the Everly Brothers' "All I have to do is dream" b/w "Blue Horizons For Me" and Toni McCann's scorching "Saturday Date" b/w "If You Don't Come Back". Two of the four Everybody's singles were re-issued in February 1966. McCann's "Saturday date" on Sunshine (which folded soon after) the other three on Spin. The four original Everybody's releases are now highly prized by collectors. 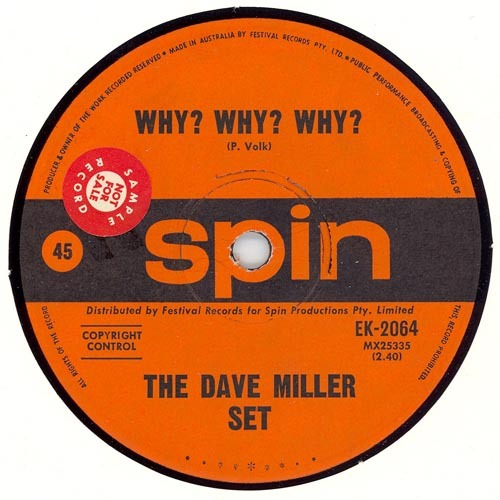 By January 1966 Everybody's had been renamed and re-launched as Spin Records and the parent company, Spin Records Production Pty Ltd now included two new partners -- Sydney entertainment entrepreneur, Harry M. Miller, and Nat Kipner, who was retained as A&R manager, but now had a financial interest in the label. After abortive negotiations with EMI, Spin Productions signed an exlusive ten-year distribution agreement with Festival Records and the first three Spin singles, released to coincide with the rebranding, were Ray Columbus' "We Want A Beat", Jeff St John & The Id's debut "Lindy Lou", and Marty Rhone's "Nature Boy". Kipner produced or co-produced (with Ossie Byrne) many of the early Spin releases, as did noted producer-arranger Bill Shepherd (who subsequently accompanied the Bee Gees to the UK as their musical director). From 1967 onwards, after the collapse of Dayman's Sunshine label, its aquisition by Festival and his subsequent appointment as a Festival house producer, Pat Aulton played a central role in Spin and he produced a large proportion of the label's output in the late '60s and early '70s. In 1966 Spin played a pivotal role in the Bee Gees story, issuing the group's final batch of Australian singles, including their first major Australian hit, "Spicks and Specks", released in September that year. It was one of Spin's most successful singles, spending 19 weeks in the Sydney charts, where it peaked at #3, and it went to #1 in other cities including Melbourne, made #1 on the newly-established national Top 40 in Go-Set magazine, who also named it their 'Best Record of the Year'. However this success had an ironic edge to it. The Bee Gees had originally signed to Leedon imprint, the former independent label established by Lee Gordon, which was acquired by Festival after Gordon's death. According to Bee Gees historian Joseph Brennan, Festival were on the verge of dropping the group after eleven successive chart failures. But the band and their manager father Hugh felt that much of the blame lay with Festival itself, and that the company evidently had little interest in promoting their career. Hugh Gibb raised questions about the legality of the boys' contract -- presumably because they were all under 18 when they signed it -- but Festival managing director Fred Marks came up with a compromise deal, agreeing to release the boys from their Leedon contract on condition that they transfer to the Spin label. At this point Kipner took over from Hugh Gibb and managed the trio until they moved back to the UK at the start of 1967, where they signed with Robert Stigwood and the NEMS organisation. Once signed to Spin, Nat Kipner's support and guidance proved invaluable to The Bee Gees' career, as were the production skills and tutelage of independent producer and studio owner Ossie Byrne. Over several months during 1966 Byrne gave the Gibb boys virtually unlimited time in his home-made St Clair Studio at Hurstville and they have acknowledged that Ossie's contributions were crucial in enabling them to come to find their feet as studio performers. Despite Festival's earlier misgivings about the band, the Spin deal proved to be a lucrative one for both Spin and Festival. After they arrived in Britain, The Bee signed with Stigwood's RSO Records (distrbuted by Polydor) for the UK and Atlantic Records in the USA, but Spin (and therefore Festival) retained the exclusive rights to distribute The Bee Gees' recordings in Australia for the better part of a decade. The first Bee Gees single released under this arrangement was their international breakthrough hit "New York Mining Disaster 1941" (1967). Spin released some of the best local and international singles of the late Sixties, including all of The Bee Gees late '60s UK recordings. 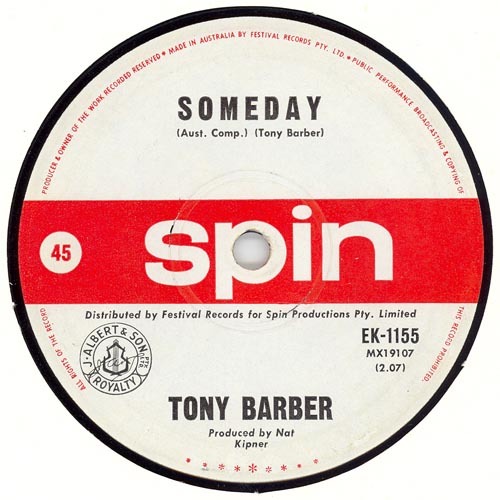 Other prominent artists on the Spin roster included former Aztec Tony Barber, Steve & The Board, Toni McCann, Ray Columbus, Jeff St John, Marty Rhone, Tony Summers, Chris Hall & The Torquays, Ronnie Burns, The Sunsets (later renamed Tamam Shud), The Ram Jam Big Band, Janice Slater, The Dave Miller Set and expatriate Hungarian fusion group Syrius. Harry M. Miller's interest in the label also led to Spin releasing the highly successful Australian cast recording of Hair in 1970, which was the first Australian cast recording LP to be awarded a Gold Record. The label was very productive, with 116 singles, 35 EPs and 38 albums issued over the eight years between May 1966 and May 1974. Spin typically released 2-3 singles per month during its peak years. All its recordings were manufactured and distributed by Festival Records. Up to 1973, all singles distributed by Festival were catalogued in a consecutive four-figure series, with the different labels identified by prefixes. Festival's own releases (and some of its licenced overseas recordings) were identified with a "FK" prefix (e.g. FK-1340). Spin singles were identified by the prefix "EK", an artefact of its original incarnation as "Everybody's". The final Spin single release, one of only two in Festaival's new "K" series (1973-74), was The Bee Gees' "Mr Natural". Spin's EP and LP releases were similarly catalogued; Festival catalogued all EPs in its consecutive '11000' series, prefixed with a two-letter ID prefix (Spin's was "EX"). Spin LPs were initially catalogued in Festival's '30000' series and identified with an "EL" prefix"; this series changed to Festival's '930000' series ca. 1967. Early Spin LPs were released in mono; Jeff St John & The Id's Big Time Operators was Spin's first stereo LP and one of the first stereo pop albums by an Australian group. The original Australian cast recording of The Boyfriend (Sep. 1968) was the last Spin LP in mono and all subsequent albums were issued in stereo. Spin's last two LPs -- The Bee Gees' Double Gold and Mr Natural (1974) were issued under Festival's new L series catalogue. Spin Productions went into liquidation in mid-1974 and the catalogue was subsequently purchased by Festival. The Spin name was revived briefly ca. 2000 for Fesival's superb series of CD reissues, but this project was cancelled soon after the company's 50th anniversary as the company was subjected to cost-cutting 'restructures'. Regrettably Festival Mushroom went into liquidation in mid-2005 and the recording archive -- including the Spin catalogue -- was purchased by the Warner Music group for AU$10 million in October 2005. EK-1215 Jan .1966 Ray Columbus "We Want A Beat"
EK-1220 Jan. 1966 Jeff St John & The Id "Lindy Lou"
EK-1155* Mar. 1966 Tony Barber "Someday"
EK-1270 Mar. 1966 Tony Summers & The Echoes "I'm On The Right Side"
"I only have myself to blame"
EK-1271 Mar. 1966 Steve & The Board "Margot"
EK-1272 May 1966 Chris Hall & The Torquays "Don't Ask Me Why"
EK-1280 Jun. 1966 Geoff "tangle-Tongue" Mack "I've Had Everything"
"Give It A Go, Joe"
EK-1294 Mar. 1966 Marty Rhone "Thirteen Women"
EK-1321 Apr. 1966 Tony Barber "Wait By The Water"
EK-1328 May 1966 Jeff St John & The Id "The Jerk"
"Take This Hurt Off Me"
EK-1345 May 1966 The Bee Gees "Monday's Rain"
EK-1346 May 1966 Ronnie Burns "Very Last Day"
EK-1383 June 1966 Marty Rhone & The Soul Agents "I Want You Back"
"What More Can I Do"
EK-1384 June 1966 The Bee Gees "Monday's Rain"
EK-1401 June 1966 Tony Barber "Wondrous Place"
EK-1446 Aug. 1966 Jeff St John & The Id "Black Girl"
EK-1447 Aug. 1966 Ronnie Burns "True Ture Love"
EK-1463 Aug. 1966 Steve & The Board "Now I'm Older"
EK-1474 Sep. 1966 The Bee Gees "Spicks and Specks"
EK-1578 Dec. 1966 Ronnie Burns "Coalman"
EK-1579 Nov. 1966 Tony Barber "Looking For A Better Day"
"I Don't Want You Like That"
EK-1606 Dec. 1966 Jeff St John & The Id "Big Time Operator"
EK-1634 Jan. 1967 The Bee Gees "Born A Man"
EK-1681 Feb. 1967 Will Rushton & Arlene Dorgan "Madam Butterfly"
"Say That You Want Me"
EK-1690 Mar. 1967 Will Rushton & Arlene Dorgan "St Vitus Dance"
"I Want To Ring Bells"
EK-1715 Apr. 1967 Jeanine "So Long Boy"
EK-1730 Apr. 1967 Jeff St John & The Id "You Got Me hummin' "
EK-1737 Apr. 1967 Tony Barber "Birds Eye View"
EK-1771 May 1967 Barrington Davis "As Fast As I Can"
EK-1789 May 1967 Ronnie Burns "Exit Stage Right"
EK-1790 May 1967 Marty Rhone "No No No No No"
EK-1798 May 1967 The Bee Gees "New York Mining Disaster 1941"
EK-1818 June 1967 The Sunsets "The Hot Generation"
"This Is What It's All About"
EK-1845 July 1967 The Kids "How Many Birds"
EK-1891 July 1967 The Bee Gees "To Love Somebody" / Close Another Door"
EK-1941 Aug. 1967 The Ram Jam Big Band "My Girl"
EK-1942 Aug. 1967 Ronnie Burns "We've Got A Good Thing Going"
EK-1958 Oct. 1967 The Bee Gees "Massachusetts"
EK-1984 Sep. 1967 Janice Slater "Don't Let Me Be Misunderstood"
"Let The Love Come Through"
EK-1988 Sep. 1967 Freddy Hampton "Felino Malone"
EK-1989 Oct. 1967 Fia Karen "You Don't Know Here Your Interests Lie"
"I'm Making The Same Mistakes Again"
EK-1990 Oct. 1967 Dianne Horder "Here Come the Morning"
EK-2016 Oct. 1967 Jeff St John & Yama "Everybody's Gone"
EK-2053 Nov. 1967 Marty Rhone "Lonely Too Long"
EK-2064 Nov. 1967 The Dave Miller Set "Why Why Why"
EK-2092 Dec. 1967 The Bee Gees "World"
EK-2125 Jan. 1968 The Ram Jam Big Band "Sunshine And I Feel Fine"
EK-2149 Jan. 1968 Ronnie Burns "When I Was Six Years Old"
EK-2181 Feb. 1968 The Bee Gees "Words"
EK-2276 Apr. 1968 The Ram Jam Big Band "I Can't Let Go Of This Feeling"
EK-2277 May 1968 The Dave Miller Set "Hope"
EK-2278 Apr. 1968 Marty Rhone "She's Coming Home"
EK-2279 Apr. 1968 The Swingin' Times "Sue For Two"
EK-2291 May 1968 The Bee Gees "Jumbo" / The Singer Sang His Song"
EK-2362 June 1968 Dianne Horder "The Golden Days"
"Here At The Stage Door"
EK-2438 July 1968 Mike Preston "Wonderful Wonderful World"
EK-2482 Aug. 1968 The Bee Gees "I Just Gotta Get A Message To You"
EK-2550 Sep. 1968 The Dave Miller Set "Let's Get Together"
"A Bread and Butter Day"
EK-2615 Nov. 1968 1863 Establishment "Picture of a Girl"
EK-2627 Oct. 1968 Ronnie Burns "Age of Consent"
EK-2655 Dec. 1968 Mike Preston "Christmas Alphabet"
EK-2725 Feb. 1969 The Bee Gees "I Started A Joke"
EK-2728 Jan. 1969 The Trojans "Even Dolls Can Cry"
"Look At Granny Run Run"
EK-2820 Mar.1969 The Bee Gees "First of May"
EK-2877 Mar. 1969 Ronnie Burns "How'd We Ever Get This Way"
EK-2879 Mar. 1969 Mike Preston "Buena Sera Mrs Campbell"
EK-3020 May 1969 Steve Carey "Give Your Best"
EK-3035 June 1969 The Ram Jam Big Band "Lost and Found"
EK-3065 June 1969 The Bee Gees "Tomorrow Tomorrow"
EK-3158 July 1969 Marty Rhone "Ruby with the red hair"
EK-3160 July 1969 The Dave Miller Set "Mr Guy Fawkes"
EK-3184 Sep. 1969 Robin Gibb "Saved By The Bell"
EK-3236 Sep. 1969 The Bee Gees "Don't Forget To Remember"
EK-3305 Oct. 1969 The Mark IV "Groove with What You've Got"
EK-3318 Sep. 1969 Sharon Redd and Keith Glass "Easy To Be Bad"
EK-3379 Nov. 1969 Don Lane "You're Everything"
"The Small Exception of Me"
EK-3380 Nov. 1969 Ronnie Burns "Smiley"
EK-3381 Oct. 1969 The Wheelbarrow "Dame Zara"
EK-3435 Dec. 1969 Robin Gibb "One Million Years"
EK-3497 Feb. 1970 Robin Gibb "August October"
EK-3562 Feb. 1970 Mike Preston "Cellophane Disguise"
EK-3571 Mar. 1970 The Dave Miller Set "Does Anybody Really Know What Time It Is"
EK-3576 Mar. 1970 Jeff St John & Copperwine "Could Nine"
EK-3579 Mar. 1970 The Bee Gees "I.O.I.O." EK-3637 Mar. 1970 Marty Rhone "So You Want To Be A Pop Singer"
EK-3643 Apr. 1970 Maurice Gibb "railroad"
EK-3660 May 1970 The Paul McKay Sound "Melanie"
EK-3735 July 1970 Barry Gibb "I'll Kiss Your Memory"
EK-4002 Nov. 1970 Dave Miller, Leith Corbett & Friends "Reflections of a Pioneer"
EK-4051 Dec. 1970 The Bee Gees "Lonely Days"
EK-4112 Jan. 1971 Ronnie Burns "Prophet"
EKZ-4206 ? 1971 The Bee Gees "If I Only Had My Mind On Something Else"
EK-4253 June 1971 The Bee Gees "How Can You Mend A Broken Heart"
EK-4459 1971 The Bee Gees "Don't Want To Live Inside Myself"
EK-4463 1972 Syrius "I've Been Down This Before"
EK-4522 Jan. 1972 Ronnie Burns "If I Die"
EK-4533 1972 The Bee Gees "My World"
EK-4572 Mar. 1972 Fielding & Dyer "The Whale"
EK-4575 May 1972 The Paul McKay Sound "Do You Really Have A Heart"
"Hard To Keep Up With You"
EK-4657 May 1972 Factory "Live Until You Die"
EK-4735 July 1972 The Bee Gees "Run To Me"
EK-4750 July 1972 Carrl & Janie Myriad "Back To The Wildwoods Again"
EK-4895 undated The Bee Gees "Alive"
"Paper Mache Cabbages and Kings"
EK-5086 Apr. 1973 The Bee Gees "Saw A New Morning"
"My Life Has Been A Song"
K-5221 Nov. 1973 The Bee Gees "Wouldn't I Be Someone"
K-5492 May 1972 The Bee Gees "Mr Natural"
"It Doesn't Matter Much To Me"
G45 Central web forum - "Downunder Bites"